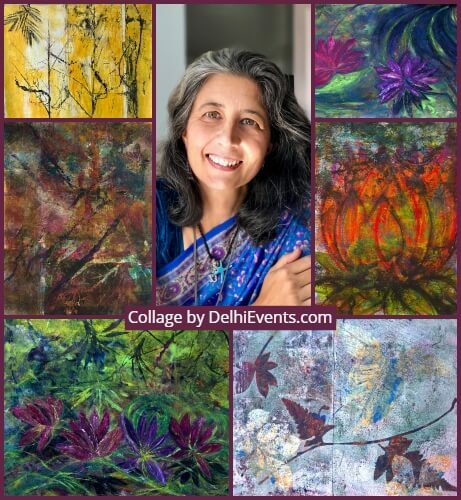 Event Description : ART EXHIBITION "No Number, No Name" solo art show by Singapore based, Indo-British artist Kavita Issar Batra. An exhibition of paintings, photographs, video and installations - that trains its lens on society through the natural, organic materials that ‘litter’ our streets and pavements. The show is Issar-Batra's first solo in India curated by art historian and curator Dr Alka Pande. A greater portion of the proceeds from the exhibition will go to Chintan Environmental Research and Action Group. Issar-Batra is drawn to the natural, organic materials that ‘litter’ our streets and pavements. They lurk in the shadows quietly accepting all that comes their way – being trampled on or driven over, subject to the vagaries of the weather which all determine their fate – whether they crumble to dust on hot dry days or slowly disintegrate into the wetness merging with the surface they find themselves on. Either way, returning to the earth, nutrients to the soil. Detached from their parent plant, these nameless flowers, leaves, seedpods, twigs, pieces of bark etc. are dying, that process may take a long or short time. For us humans too, from the time we exit our mother’s womb, the only certainty is that we will die. Again, none of us know how long what we call ‘life’ will last. We too are changing from infants to children to adulthood and then old age. Society today seems obsessed with erasing changes that are regarded as imperfections or signs of aging, to fit with idealised notions of what is beautiful. Nature points to the peace that comes with ‘acceptance’ and celebration of these changes and their impermanence. Her work gives a voice to the discarded and ignored, finding beauty and meaning in it. Issar-Batra’s art practice is based on the philosophy of serendipity. The greatest, most unexpected yet constant teacher and muse on her art journey have been the roads/pavements and their transitory inhabitants of her immediate surroundings wherever she is. For over six years they have pulled her gaze downwards and continue to be a daily journey of discovery and expression. Issar-Batra works on small A 4 size to the largest painting so far being over 16 feet long (in a collector’s private collection in Dubai). She uses different substrates, plywood, canvas and high quality acid free paper, each allows for varying outcomes. Her painting is process-led, she uses very little brush and responds intuitively in the making so she rarely has an outcome in mind before she starts. Like in nature, there is little control over the outcome of the process, the possibilities are endless, making each artwork absolutely unique. It also evokes the elements (sun, wind, rain, earth and air) that capriciously play with us, as humans, and with the detritus that inspires her. At the end, the works encourage viewers to connect at many levels and interpret as they wish. Issar-Batra is of Indo-British origin, now based in Singapore. She grew up running free on the hillsides of Nainital, Uttaranchal and then found herself in the urban chaos of Delhi. She went on to live and work in the UK for twenty years before moving to Singapore nine years ago with her family. Largely self taught, she trained traditionally three years in the studio of British artist, James Holdsworth, then was mentored for a further four years by Australian artist, David Kelly.